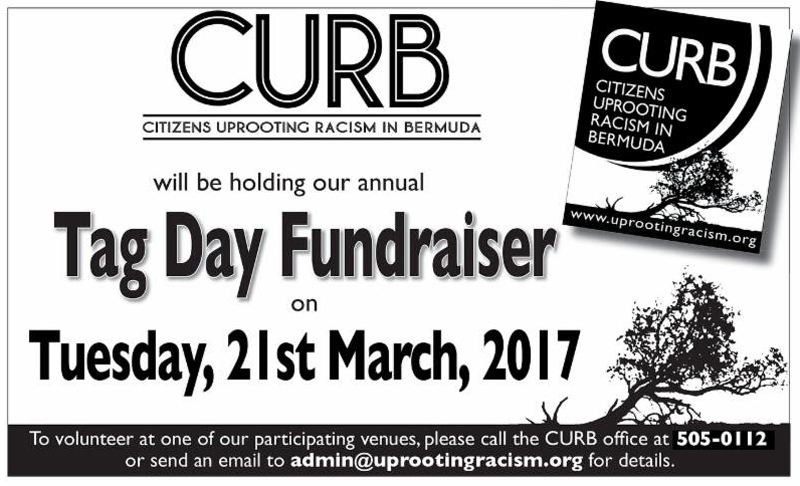 Citizens Uprooting Racism in Bermuda [CURB] will be holding their annual Tag Day Fundraiser on Tuesday, March 21. A spokesperson said, “In celebration of the UN International Day for the Elimination of Racial Discrimination [IDERD], CURB volunteers will be tagging at Paget Pharmacy, Gorhams, Lindo’s Warwick, Phoenix, Supermart, MarketPlace Hamilton, Shopping Centre and People’s Pharmacy on 21 March 2017, between 9.00am and 5.00pm. “As a not-for-profit organisation, we rely heavily on fundraising efforts in the community to support our work and our Tag Day has always been a significant success. We hope that you will come out and support our fundraising efforts! “On the same day, Imagine Bermuda will be hosting a lunchtime gathering at the entrance to Par-La-Ville park in celebration of IDERD and World Poetry Day between 12:30 – 1:30 pm. CURB volunteers will also be there with Tag Day buckets. To volunteer, call the CURB office at 505-0112 or email admin@uprootingracism.org for details.